The PA TXT Card comes in a desing especially created for Mommy Mundo members and may be easily activated by just using mobile phone. 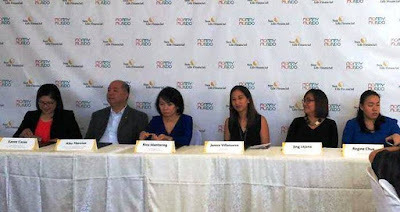 It provides protection for one year, and members may also opt to enroll up to two cards for a total of Php100,000. 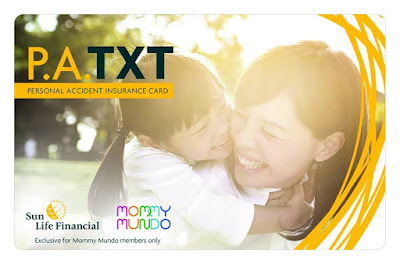 Convenient, hassle-free, affordable and with no complicated application process, the PA TXT Card will surely come in handy from moms who have their hands full attending to their families whiles pursuing their own passions. Sun Life Financial is a leading international financial services organization providing a diverse range of insurance, wealth and asset management solutions to individuals and corporate clients. Sun Life Financial has operations in a number of markets worldwide, including Canada, The United States, the United Kingdom, Ireland, Hong Kong, the Philippines, Japan, Indonesia, India, China, Australia, Singapore, Vietnam, Malaysia and Bermuda. As of December 31, 2016, Sun Life Financial had total assets under management of $903 billion. For more information, please visit www.sunlife.com.